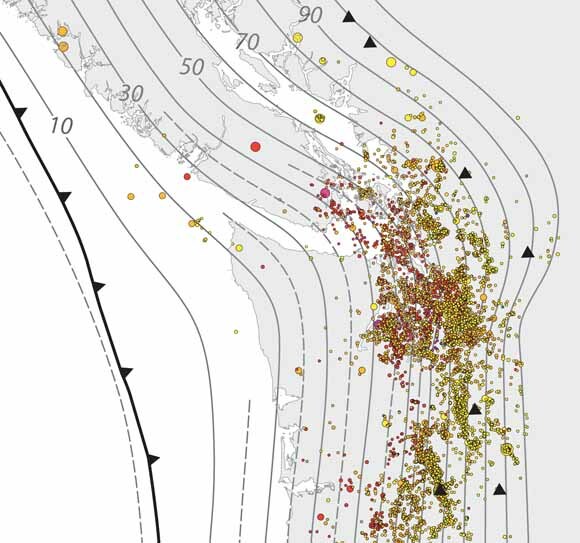 We present an updated model of the Juan de Fuca slab beneath southern British Columbia, Washington, Oregon, and northern California, and use this model to separate earthquakes occurring above and below the slab surface. The model is based on depth contours previously published by Flück and others (1997). Our model attempts to rectify a number of shortcomings in the original model and to update it with new work. The most significant improvements include (1) a gridded slab surface in geo-referenced (ArcGIS) format, (2) continuation of the slab surface to its full northern and southern edges, (3) extension of the slab surface from 50-km depth down to 110-km beneath the Cascade arc volcanoes, and (4) revision of the slab shape based on new seismic-reflection and seismic-refraction studies. We have used this surface to sort earthquakes and present some general observations and interpretations of seismicity patterns revealed by our analysis. In addition, we provide files of earthquakes above and below the slab surface and a 3-D animation or fly-through showing a shaded-relief map with plate boundaries, the slab surface, and hypocenters for use as a visualization tool.